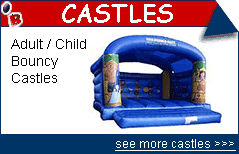 King Bounce Alot - Bouncy castle hire in northamptonshire, leicestershire, cambridgeshire, bedfordshire, warwickshire and other uk midland locations. 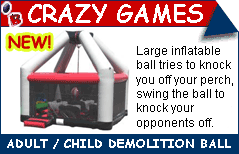 Call us with regard to hiring bouncy castles, rides, crazy games, slides, sumo wrestling, surfing simulator, rodeo bull, bungee runs, gladiators and other inflatables in kettering, corby, wellingborough, rushden, northampton, daventry, leicester, cambridge, peterborough, birmingham, warwick and bedford. 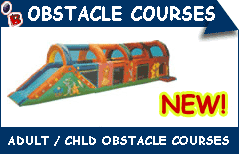 Our inflatables are ideal for kids parties, adult parties and a corporate or business garden party. Large and small events are catered for and we are fully insured. We offer cheap and discount prices in school holidays and for larger events. 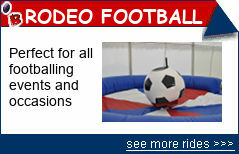 Amazing bargains on ex-rental inflatables For Sale. Never to be repeated prices and when they're gone, they're gone! Click here to be shocked! 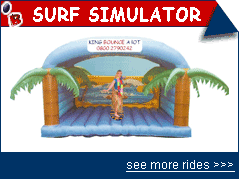 Get half price bouncy castles, slides, and all other inflatables with any rodeo bull or surf simulator booking! We accept all major Credit/Debit Cards at time of booking or cash on delivery on day of event. Payment by BACs or cheque by arrangement only. Welcome to KING BOUNCE ALOT! 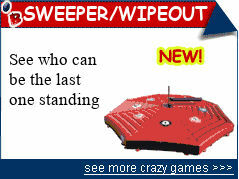 KING BOUNCE ALOT - if you're looking for the best in fun inflatables then you have come to the right place! 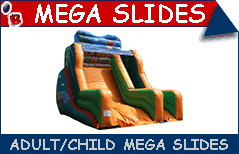 We have a huge range of slides, rides, castles and crazy games to hire for all ages! We also have fantastic deals on large packages and corporate events. Check out our Wild West, Hawaiian, Pirates of the Caribbean and Winter theme party packages - a must for all themed events!